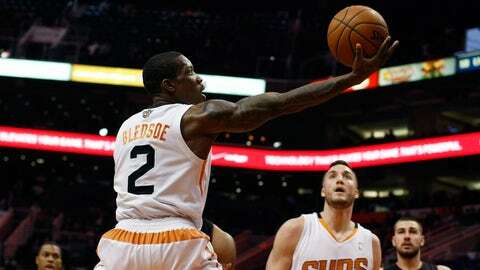 Point guard Eric Bledsoe is second on the Suns in points (18) and assists (5.8) per game. The upstart Suns had their short-term outlook clouded a bit Saturday when the team announced that playmaking point guard Eric Bledsoe will miss at least another week with a sprained right knee. Looking at the extremely limited real estate on the bright side, Phoenix still has a very good point guard in relatively fine health. Goran Dragic, the healthy point man, has been playing extremely well, too. But Bledsoe, according to a Suns press release, will miss Saturday night’s game against the Bucks and beyond, with his knee being re-evaluated in a week. Bledsoe injured the knee during Monday’s rout of the Clippers in Los Angeles and didn’t play in Thursday’s home loss to the Grizzlies. As of the announcement, he ranks second on the Suns in scoring at 18 points per game and assists at 5.4 per game. He also is averaging 4.3 rebounds and a team-best 1.54 steals. Bledsoe is just the latest elite Western Conference point guard to be sidelined in what seems to be a run on pain at that position. And considering the rising excitement related to the Suns’ unexpected playoff bid, the timing really hurts. Clippers superstar Chris Paul –– Bledsoe’s on-court mentor before this season — will be out a reported 4-6 weeks with a sprained shoulder. Russell Westbrook of the Thunder already was missing in action. With Los Angeles and Oklahoma City compromised by these injuries, hay can be made by other optimistic Western Conference teams, Phoenix included. After entertaining the Bucks, the Suns will embark on a five-game roadie featuring five stops in the home cities of teams with records of .500 or less. But each of these teams (the Bulls, Timberwolves, Grizzlies, Pistons and Knicks) certainly is capable of beating the Suns, even with Bledsoe on the floor. The Grizzlies just took down the Suns in Phoenix and had a 19-point triumph when the teams met in Memphis early last month. And the Knicks recently knocked off the Spurs in San Antonio. Four of these road tests will occur within a week of Bledsoe’s re-evaluation schedule, meaning that the double-point-guard attack will not be an option. Bouncy shooting guard Gerald Green has been a real find as both starter and reserve, but since coach Jeff Hornacek said Saturday that Green will be moved into the starting lineup in Bledsoe’s absence, the bench options will be limited. With Bledsoe down, the Suns will require consistent (and efficient) contributions from the Morris twins as well as third point guard Ish Smith to keep playing at a playoff-caliber level.